Varys is—and has always been—one of the most fascinating characters on Game of Thrones, and without a doubt, the most enigmatic. With his network of spies, the Spider knows all, but tells very little. 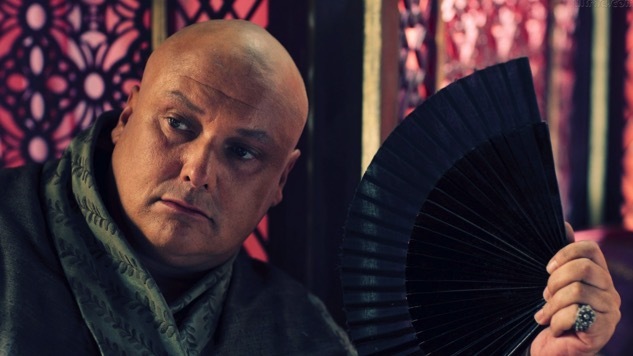 Many times, it’s difficult to determine whether Varys is good or actually the embodiment of evil, but as the series goes on, the layers of his personality come to light. Here are 12 iconic from the character, portrayed to perfect effect by the great Conleth Hill. In a tête-à-tête with Ned Stark, Varys asks him how Bran is doing, after the tragic fall (or push). Ned informs him that he will never walk again, but his mind is sound. In a conversation with Ilyrio Mopatis, overheard by Arya, Ilyrio and Varys plot the future of the throne. Littlefinger pokes fun at Varys being castrated, asking him if he has his testicles stored away. Varys responds with his usual sharp wit and elegance. When Varys sneaks in the dungeon to visit Ned Stark, he brings him some water to drink. Ned doesn’t trust it, calling on Varys to taste test it. It’s true, it’s hard to trust Varys, but as he slowly reveals later in the series, perhaps he is the most reliable. As the small council grows smaller with Tyrion as Hand, Varys and Tyrion grow closer. Varys, impressed by Tyrion’s intelligence, poses him a riddle, and answers it with this inspiring response. When Tyrion comes to Varys hoping to find concrete answers as to whom it was that tried to kill him, Varys evades the question with this wise truth. Varys often repeats that his loyalty lies with the realm, regardless of who is on the throne. In this conversation, Littlefinger challenges the lie they maintain in supporting a ruler that is not the rightful monarch. But Varys knows that, for many people, there is comfort in the lie. In a conversation with Prince Oberyn, Varys explains that even before he was clipped, he had no desire for other men or women—and such a lack has had its benefits. Once settled across the sea, Varys sits down and has a serious conversation with Tyrion, revealing more of his inner machinations than he ever has before. He’s been waiting for the Baratheon downfall for years, and believes Tyrion has a part to play in his plan. Varys keeps his wishes well-hidden, and throughout the series, no one know whether to trust him or not—whether to like him or not. He finally reveals some insight into his patiently laid plan. BOOM. What Varys has wanted all along. Finally. Varys finds Tyrion, and explains how—without really explaining much at all. Madina Papadopoulos is a New York-based freelance writer, author, and regular contributor to Paste. You can follow her adventures on Instagram and Twitter.